American business leader, entrepreneur, and noted philanthropist Morton Mandel shares lessons he gleaned from co-founding and leading, along with his brothers Jack and Joe, Premier Industrial Corporation, a major industrial parts and electronic components manufacturer and distributor. Now for readers everywhere who are interested in studying leadership development, It's All About Who describes Mandel's approach to finding, recruiting and cultivating "A" players. 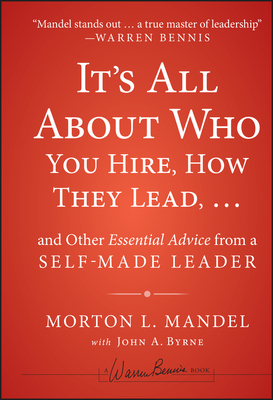 In his book, Mandel shares his fine-tuned set of practices to develop leaders that have proven to deliver dramatically better results. Containing sixteen core sections, "It's All About Who" covers key strategic topics from "Building a Rich, Deep, and Ethical Culture" to "Killing Yourself for Your Customer" to "Using Business Ideas in the Social Sector." What makes Mandel unique is his selflessness in pursuing a life of purpose. Mandel has lived in two worlds: the world of profit and the world of social impact. Even as chairman and CEO of a New York Stock Exchange company for more than three decades, he spent as much as a third of his time in the social sector. Mandel has personally founded more than a dozen non-profit organizations. His deep-seated passion is evident in the mission of his Foundation: "To invest in people with the values, ability and passion to change the world." Morton Mandel is a self-made billionaire, entrepreneur and philanthropist. With his brothers, Jack and Joseph, he cofounded Premier Industrial Corporation in 1940, eventually merging it with Farnell Electronics in a $3 billion transaction. The brothers established the Jack, Joseph and Morton Mandel Foundation, which funds numerous social leadership initiatives all over the world. Mort was named by Peter Drucker as one of three impressive CEOs alongside Jack Welch and Andy Grove. He learned how to start and build enduring institutions from the ground up. His financial success and passion allowed him to partner with non-profits of all kinds with a laser-like focus on developing professional leadership, able to truly transform people's lives. He has personally founded more than a dozen non-profit organizations. His deep-seated passion is evident in the mission of his Foundation: "To invest in people with the values, ability, and passion to change the world." Mort has fine-tuned a set of practices that have been proven to deliver dramatically better results. In his book, It's All About Who..., he shows how important it is to find, recruit, and cultivate "A" players for leadership roles. This can lead to better strategies, better execution, and greater client satisfaction. Further, he believes that personal values matter - honesty, decency, respect, and generosity are essential elements in a life worth living. John A. Byrne, the former executive editor of BusinessWeek and editor in chief of Fast Company magazine, is the author or coauthor of ten other business books, including two New York Times best sellers. With legendary General Electric Co. CEO Jack Welch, he wrote Jack: Straight from the Gut, one of the most successful business books in history.